It’s another exciting night of American Idol on FOX with an all new Wednesday January 28, season 14 Episode 7 called “Auditions #7” and we have your weekly recap below. On tonight’s episode, auditions continue. If you want to find out how this season’s judges are shaking things up, head over here. On the last episode, everyone’s favorite singing competition continued with auditions to find those who had what it takes to become the next American Idol. Did you watch the last episode? If you missed it, we have a full and detailed recap right here for you. 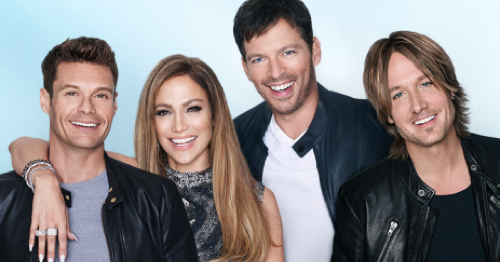 On tonight’s episode of American Idol, the judges Jennifer Lopez, Harry Connick Jr, and Keith Urban head to San Francisco for the final round of auditions, and the last chance for singers to secure a spot in Hollywood. The first American Idol Hopeful is 15 year old Katherine Skinner – she claims that she was told to come audition by her 19 year old psychic cat Mustafa. She wows the judges with her fur coat and swears that David Bowie gave it to her in the 1970’s. She performs a rendition of “Shake It Out” by Florence and The Machine. The judges try to keep their composure, and Jennifer Lopez admits that she does think Katherine is talented – but she isn’t sure if she is right for American Idol. Harry says that he liked her stories and he thinks that she is really talents. Keith Urban agrees that Katherine is “bold and fearless.” All three judges vote “yes” and decide to give Katherine a Golden Ticket to Hollywood. Erika David performs Alicia Key’s hit song “No One,” for the American Idol judges – she thinks that if she is sassy enough, she will be able to win over judge Jennifer Lopez. Harry announces that he likes Erika and he “wants to see her one more time. Keith Urban says “no,” so it is up to Jennifer Lopez to break the tie. Jennifer says that Erika definitely needs some more work, but she decides to give her one more chance and gives her a Golden Ticket to Hollywood. 17 year old California native Andrew Bloom auditions for the American Idol judges with an acoustic version of “Too Close.” The judges rave that he looks like Tim Tebow, and Jennifer cheers for him when he is done singing. Keith raves that Andrew has talent because he got all of the judges singing and dancing, Harry warns him that he “needs to be careful with the blues licks.” All three judges vote “yes,” and give Andrew his Golden Ticket to Hollywood. Kellyeann Rodgers is the next singer to audition for the American Idol judges in San Francisno. Jennifer, Harry, and Keith are unanimous and they all vote “yes,” she is getting a Golden Ticket to Hollywood. The judges try not to laugh hysterically at her as she struggles to get out of the double doors and cant figure out which way the exit is. Up next is San Francisco native Reno Anoi’I, he plays a rendition of a Rod Stewart song on his ukulele. Keith Urban raves that Reno has a great voice, and Jennifer agrees that he has a “pretty voice” but she thinks that he needs to sing more from his feelings to make his songs more pure. Harry Connick Jr. says Reno has a “great voice,” but he isn’t sure if he has what it takes to be on American Idol. After a lengthy critique, the judges all vote “yes” and decide to give Reno a Golden Ticket to Hollywood. Matthew Sequira, Luke Randall, and Sade Shine all come up short – the judges are unimpressed by their singing and do not give them a Hold Ticket to Hollywood. Up next is New Virginia native Rayvon Owen – he announces to the judges he will be singing “Wide Awake” by Katy Perry. When is done J-Lo giddily squeals, “you can sing!” Keith Urban agrees that he made a great song choice, and Rayvon’s tone is beautiful. Harry agrees that Rayvon sounded great and looked great. All three judges vote “yes” and give him a Golden Ticket to Hollywood. Up next is a duet – identical 20 year old twins Ezekiel & Jeremiah Cardenas. Ezekiel plays the guitar while Jeremiah sings, but the judges are unimpressed. The final San Francisco singer to audition is 17 year old Maddy Hudson. She sings a rendition of “Resentment,” to Jennifer, Harry, and Keith and blows them away. The American Idol judges are unanimous, they all vote “yes” and Jennifer announces that Maddy is one of her favorites this season. The judges give Maddy Hudson her Golden Ticket to Hollywood.